Setting the standard by which all other private golf communities are measured, Desert Highlands Real Estateconsists of 560 homesites spread out amongst 850 acres of lush Sonoran desert. Currently, over 485 custom homes have been completed in Desert Highlands. Homes range in price from $995,000 to over $11,000,000. Homesites start from the mid $600,000's. Great features separate our community from average communities. We think you will agree that Desert Highlands Real Estate amenities set us apart. For the golf enthusiast Desert Highlands Real Estate is proud to feature an 18 hole Jack Nicklaus designed golf course, home to the 1983 and 1984 PGA SkinsGame. The variety of tennis court surfaces drew admiration for providing residents a richer range of recreational options, not golf alone. And, the fulfillment of the original developer vision has become the ideal that developers and residents of other communities recognize as the ultimate achievement. Casual dining at The Grille and Mesa Grille is designed just for you, with the finest in comfort foods, reasonably priced. We also offer fine dining in The Ventana Room. The Bar at Desert Highlands offers a casual setting orenjoy the outdoor scenery from the beautiful patio area. Avg Cost of Home Sites: Homesites start from the mid $700,000's. Price Range of Homes for Sale: Homes range in price from the low 1 Millions to over $11,000,000 with an average price of 1.6 mil. Gatehouse: A gated community with professionally trained security personnel. Club Structure: Member owned private community. Golf Course: An 18 hole Jack Nicklaus designed golf course, home to the 1983 and 1984 PGA Skins Game. The Racquet Club is a premier tennis facility offering its members world class instruction and grass court tennis is available. 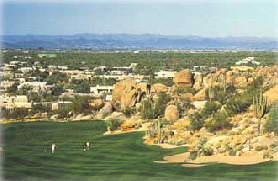 When you decide to buy Scottsdale AZ Real Estate, (whether it's Desert Highlands Real Estate or some other premium Scottsdale AZ Real estate) be prepared to live amidst some of the most renowned luxury resorts and spas, championship golf courses, gorgeous homes, and natural desert beauty in the world. With all these amenities at your fingertips you’ll be living in paradise.